It was an eye-opening kind of situation for me that the whole meal plan was thrown in by my hubby’s friends(owner of the house)father!came to know that he was an excellent cook.I had loads of doubts about vegetarian brahmin type cooking to my surprise he presented me a small collection of recipes that was done in his own way.This small book is a real treasure hunt for me that I will keep all my life once again thanking him for being an another great inspiration that I have found in the cooking world.I happily returned home and this particular simple tomato rasam without dal recipe was also there in the book and I did try this!was a super hit at my home. 1.First powder the “for powder” ingredients and keep ready. 2.Then grind tomatoes and add to the container that you are going to make rasam. 3.Add Salt,garlic-green chilles crushed and powder. 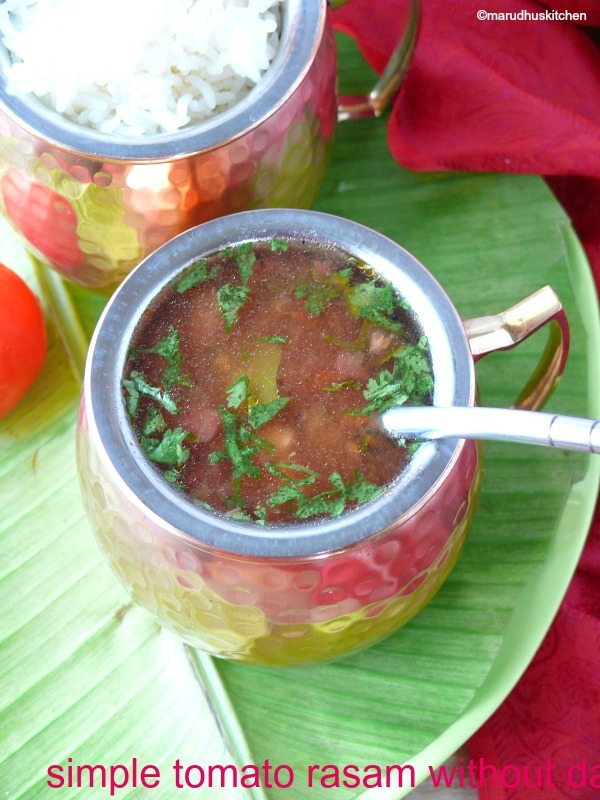 4.Mix up water making up to rasam consistency and check for salt and tanginess. 5.Now add little jaggery to it. 6.Switch on the stove and keep the vessel and let it to boil. 7.In-between keep kadai with ghee add mustard and when it crackles add asafoetida and switch off. 8.Let it boil for some 2-3 minutes. 9.Now switch off and add chopped coriander,curry leaves. 10.Finally add tempering and switch off. All time comforting rasam!! Yumm!! 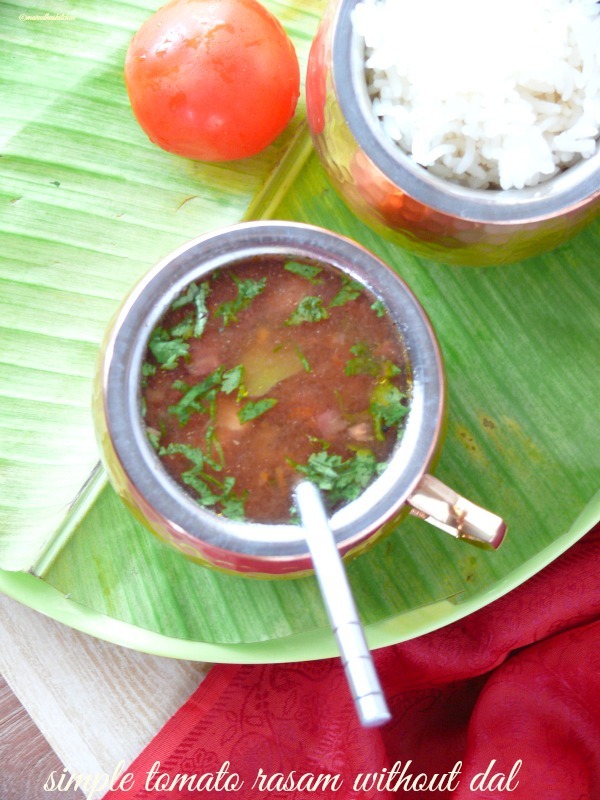 This tomato rasam looks absolutely delicious, Vani!